It's Thank Goodness It's Finished Friday! Being hosted here in Nova Scotia, Canada. If you are visiting via the TGIFF link and have never visited before, welcome. If you have been here before, welcome back. To get to know me, please visit my post from the recent Meet Maritime Modern Blog Hop and my post from Blogathon Canada. I used my new long arm to do some FMQ stippling. 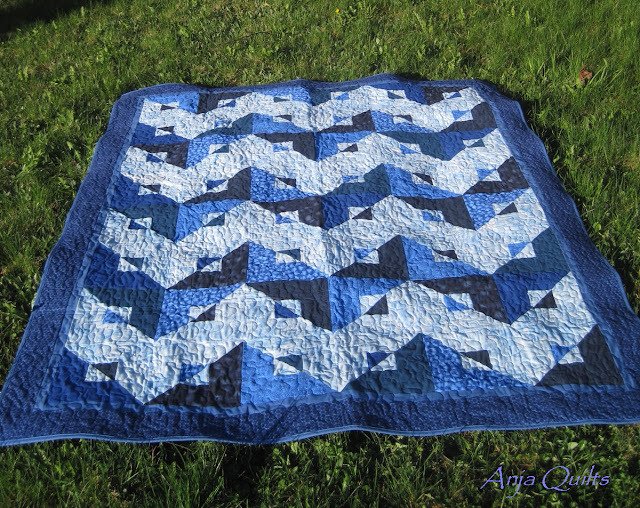 I am pleased with my FMQ efforts, and the customer was very happy. Now it's time for your finishes. Post your finish using the linkup below. Don't forget to visit some of the other finishes and share some love and encouragement. Please include a link and/or the TGIFF button in your post so your readers can also view all the great finishes. Saturday was Sew In!! 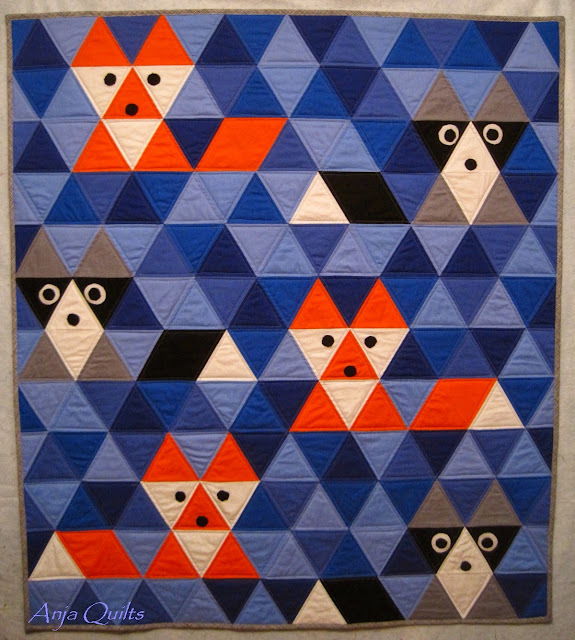 Maritime Modern Quilt Guild hosts the best Sew Ins. Plenty of sewing, plenty of socializing, and so much FUN. 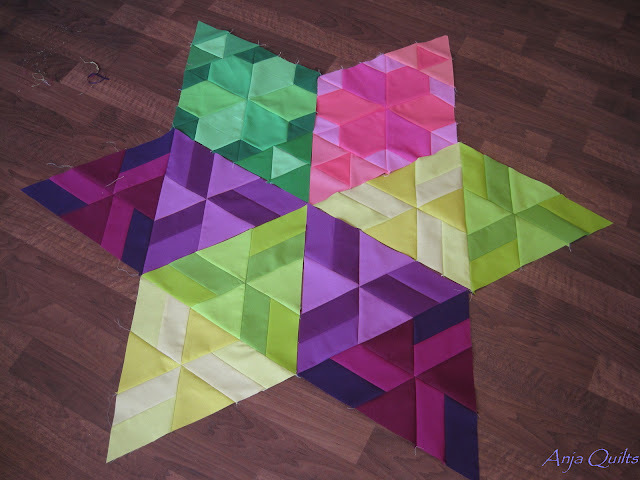 I decided to take advantage of the dedicated time and get caught up on my Gravity Quilt Along blocks. 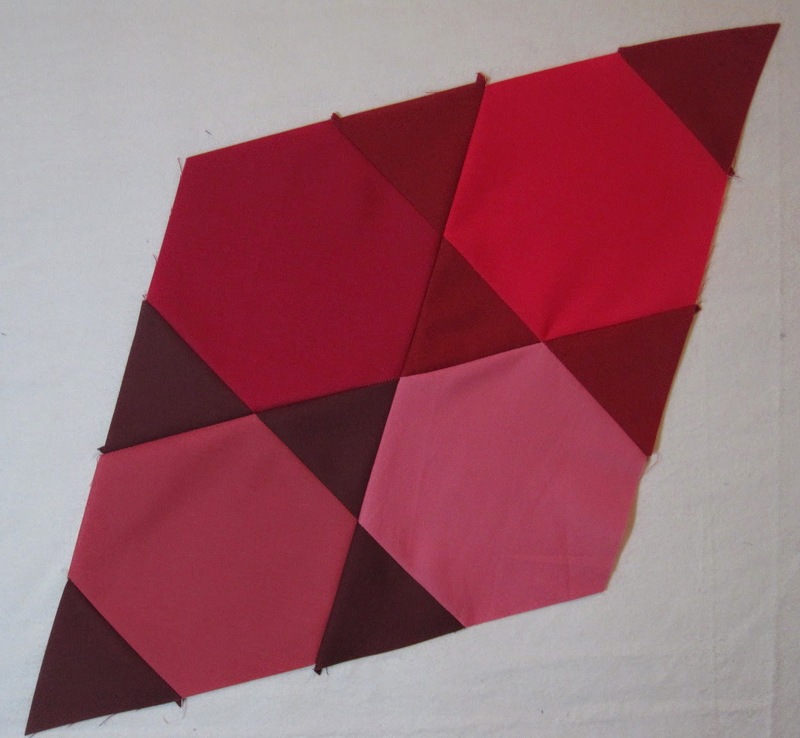 I joined the QAL at Blocks 2 and 3, so had to go back and complete Block 1. Piecing of Block 4 Intergalactic was easy. So many wonderful Kona colours to cross off my list! My blocks decided to play with the blocks @ Purple Boots and Pigtails. Val is doing the QAL as well. You should stop by to see how her blocks are progressing. And then Block 5 felt lonely and wanted to play as well. I'm anxious to get all these blocks pieced together. They are going to be so awesome together. I encourage you to visit so you can see what everyone has been up to this week. *Don't forget to come back on Friday -- I'm hosting TGIFF. It's an amazing feeling to get caught up in a quilt along. I backtracked and completed Block 1 - Horizon in the Gravity Quilt Along hosted by Busy Hands Quilts. These were fun blocks to make -- easy to piece. I love being able to check off so many Kona colours! My goal is to use all 303 colours. I'm feeling a bit excited and nervous all at the same time -- I'm hosting TGIFF on Friday. Please stop by on Friday to see what everyone has been working on this week. It's so motivating and inspiring to see all the fabulous completed projects. It's Friday! And I have a finish! It appears I have been on a Kona and Jaybird Quilts kick lately. Rocky Candy is a fun, quick table topper. Camellia, Niagara, Lagoon, Tangerine, Papaya, Kiwi, and Black. Needed some FMQ practice -- athough FMQ was probably not the best quilting choice for this project. I love my new quilt labels. 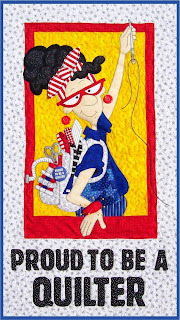 You can order them over at Sew Fresh Quilts. 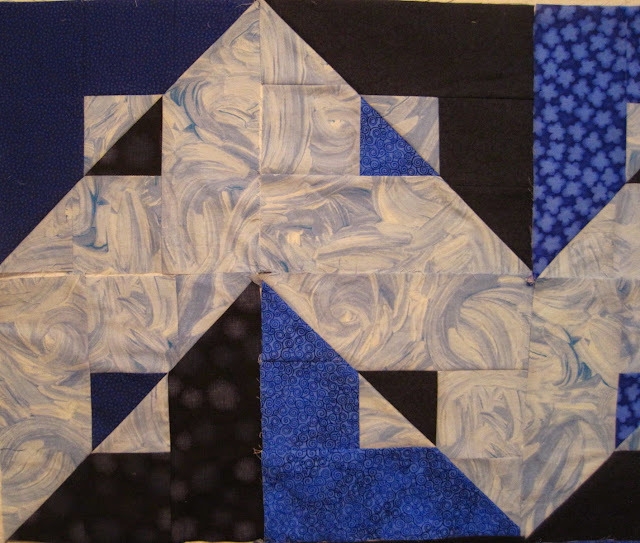 Block 3 of the Gravity Quilt Along was easy to piece. And it's been fun to play with so many Kona colours! 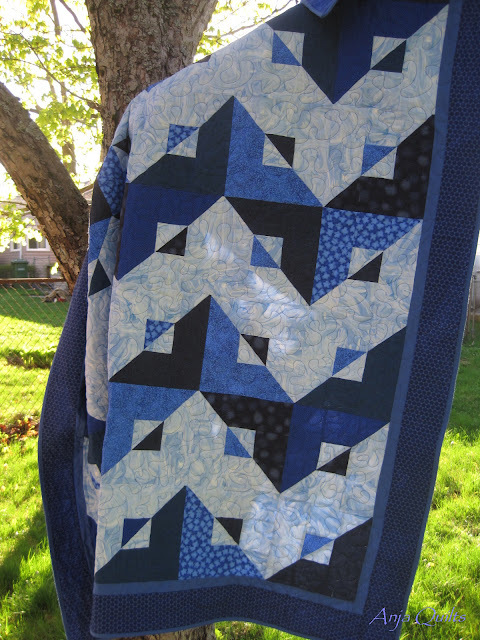 I love patterns by Jaybird Quilts. 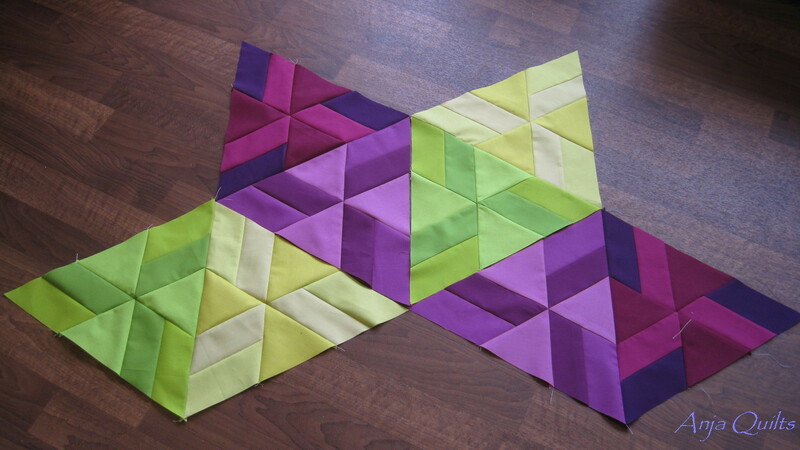 The patterns look complicated to piece, but once you actually start piecing, it's so very easy. 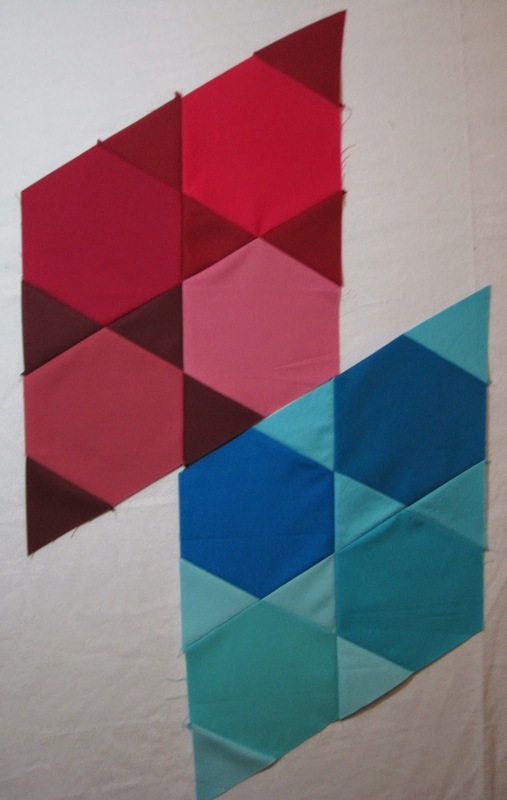 Stop by Busy Hands Quilts to see the progress of the Quilt Along. 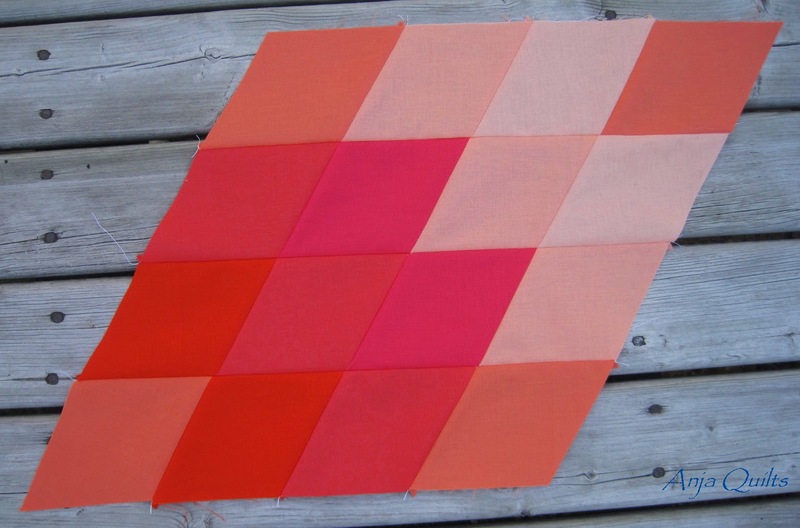 The Maritime Modern Quilt Guild is participating in a pillow swap with the Edmonton Modern Quilt Guild. Good reason to try something new. 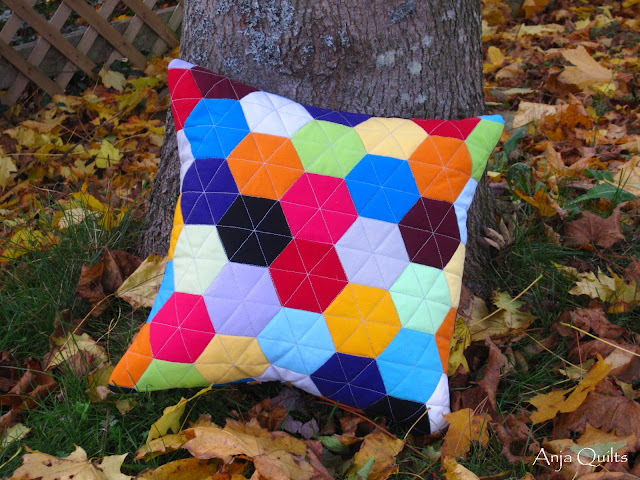 Found the Sassy Lattice Pillow pattern over at Moda Bake Shop. Practicing my free motion quilting. I went with a darker pink backing so I could use the selvage as the finished edge. This an awesome technique used by Linda aka Scrapmaster, and this was the first time I had the opportunity to do it. Congratulations to #10 Andrea R who is the winner of my Meet Maritime Modern Blog Hop giveaway. Looking forward to see what you create from the fat quarters. Today's TGIFF is being hosted by my friend Jenn over at A Quarter Inch from the Edge. Pop over to say hello and to see what everyone else has been working on this week. Also linking up with Crazy Mom Quilts for Finish It Up Friday. 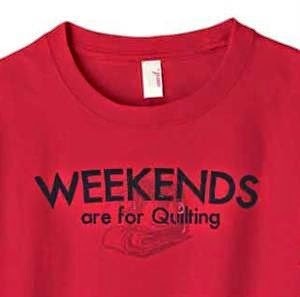 Here's to some great sewing this long weekend. 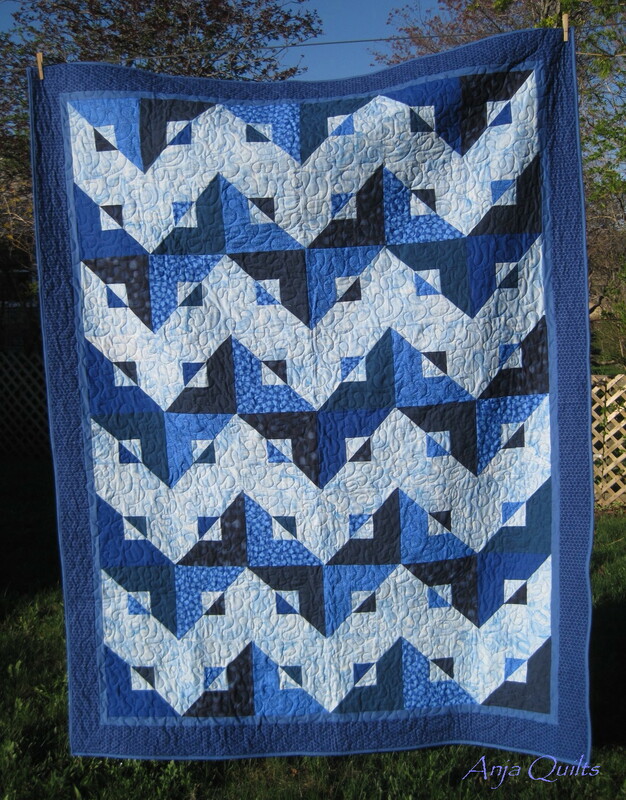 A few years ago, I attended a workshop hosted by Mariners Quilt Guild. 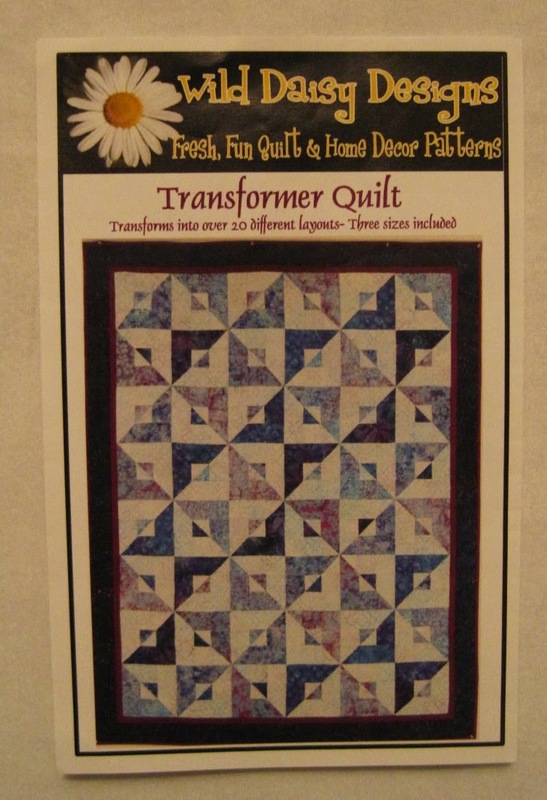 The teacher works at our LQS, and the Transformer pattern is one of his designs. 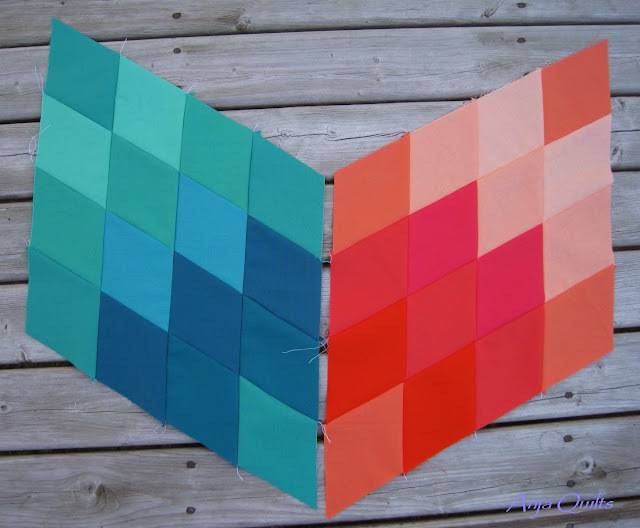 Basically, make a quilt block, cut it in half (diagonally or vertically), and then sew two halves together to get the final block. My blocks are cut in half on the diagonal. Managed to catch the last of the daylight. The layout possibilities are endless. This is my Transformer quilt from the workshop. So it seems that it doesn't take much to get me to start another project...especially when there are many WIP's still yet to be completed. 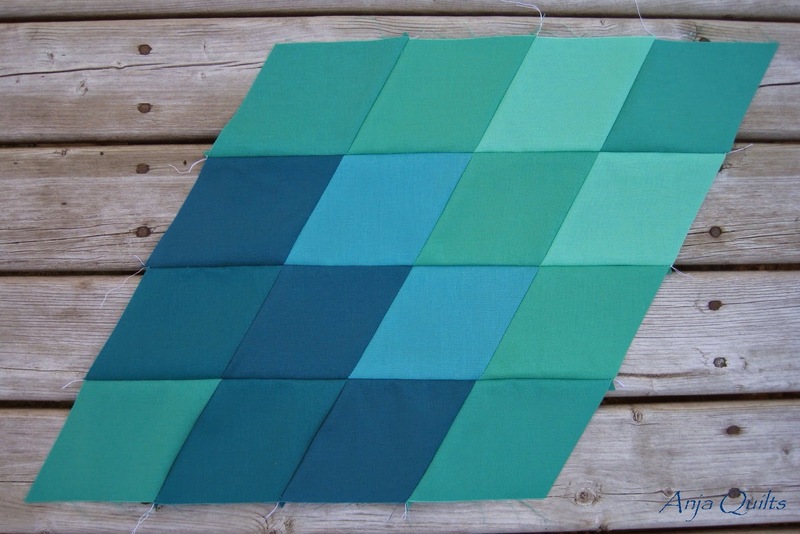 But I couldn't resist the pull of another Jaybird Quilts pattern and the chance to use 114 Kona solids in one project. 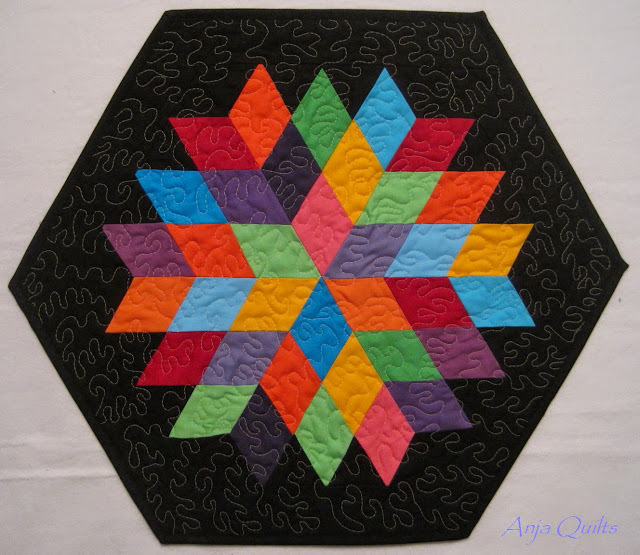 Busy Hands Quilts is hosting a Quilt Along. I need to catch up and complete Block 1, but I managed to get on board in time for Block 2 - Constellation, so I'm not that far behind. Thanks to Val @ Purple Boots and Pigtails for the encouragement to start this project. Is peer pressure a good thing? 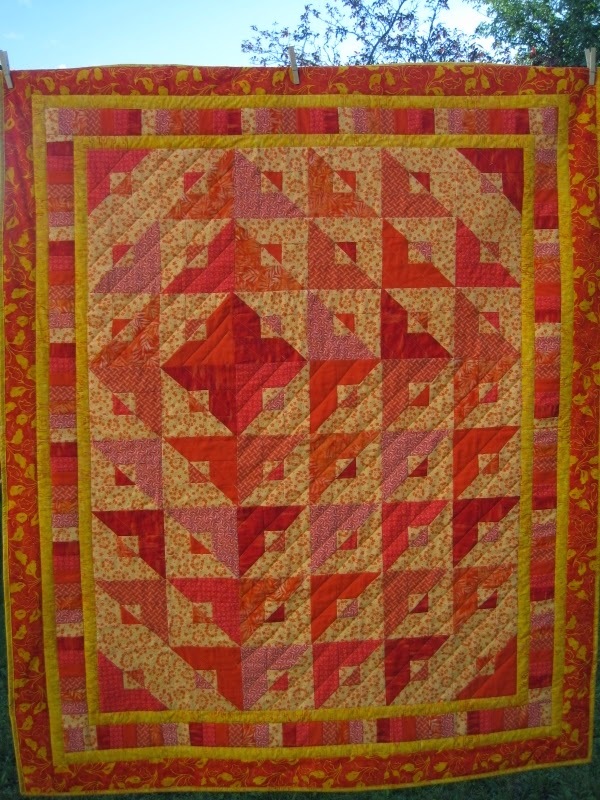 She's coerced taught me to do improv piecing and convinced supported me to purchase her long arm quilting machine. I'm afraid of what's next. But luckily, we share a birthday, so I trust her not to lead me down the wrong path. But I'll happily follow her to our LQS. Thanks for helping me move outside of my comfort zone, Val! If you haven't entered my giveaway for the Meet Maritime Modern Blog Hop, you have one more day to enter. 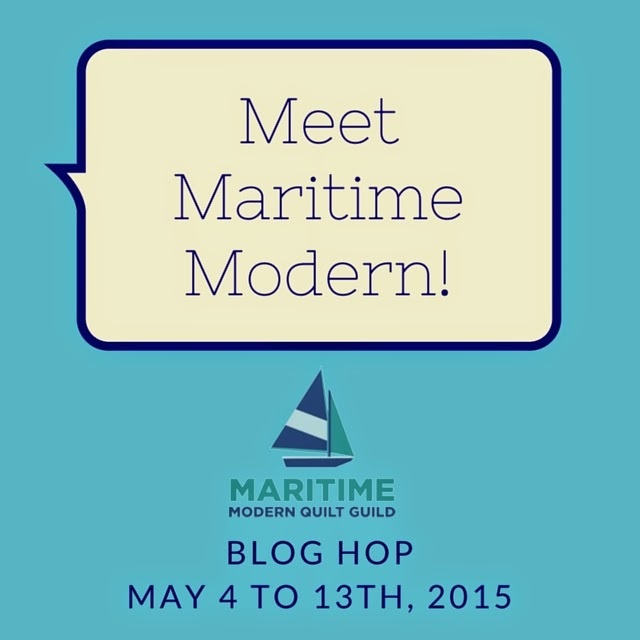 Welcome to the fourth stop on the Meet Maritime Modern Blog Hop. 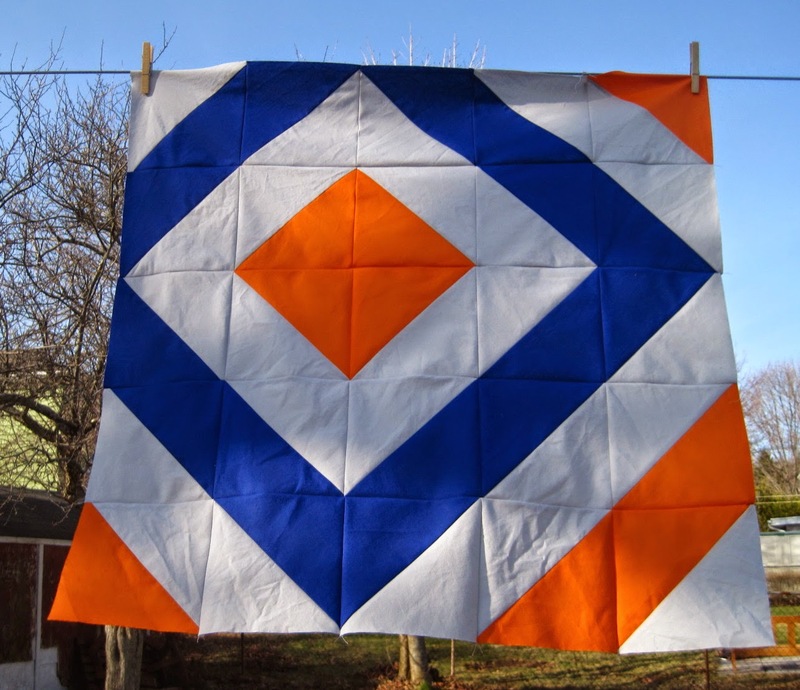 The blog hop is your opportunity to meet some of the members in the Maritime Modern Quilt Guild. The guild began about a year and a half ago. It has been a great time meeting new friends and learning new things. Who knew that I'd enjoy improv piecing. Or that I'd purchase a long arm. The guild has been an encouragement to move outside of my comfort zone, even though I often resist it at first. 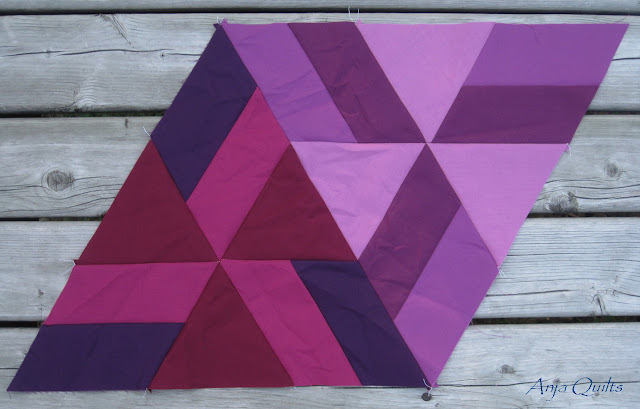 I do resist paper piecing though...that's one technique I haven't been able to embrace. By day, I'm the Executive Assistant to the Chief Judge of the Provincial Court. By night, I'm a lifelong Girl Guide, a quilter, and a walker who has been learning/pretending to be a runner. Next weekend will be my first 5K that I will attempt some running...not sure I'm ready for that. 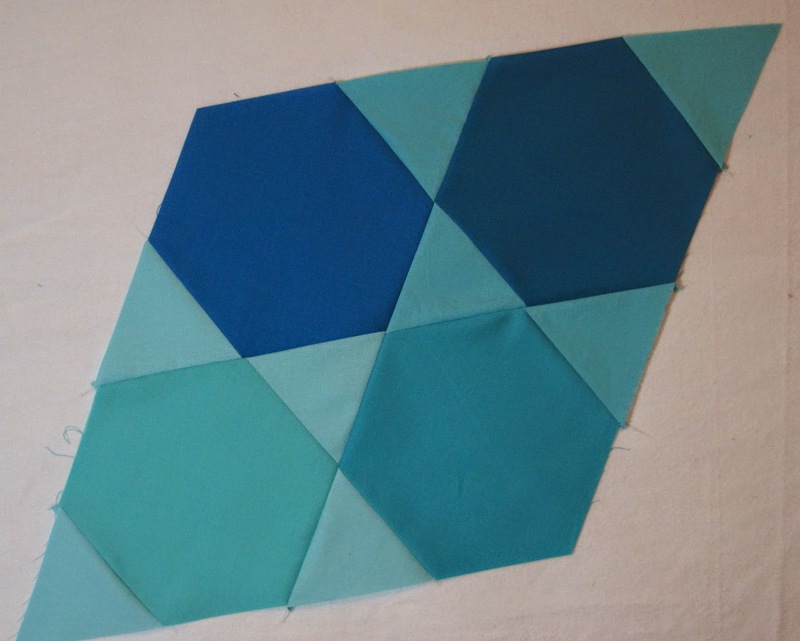 I have many WIP's in my sewing room, but they are mostly in the cutting fabric phase. I love piecing quilt tops, but not so much the actual quilting. I seem to have a recent addiction to Kona solids and Jaybird Quilt patterns. 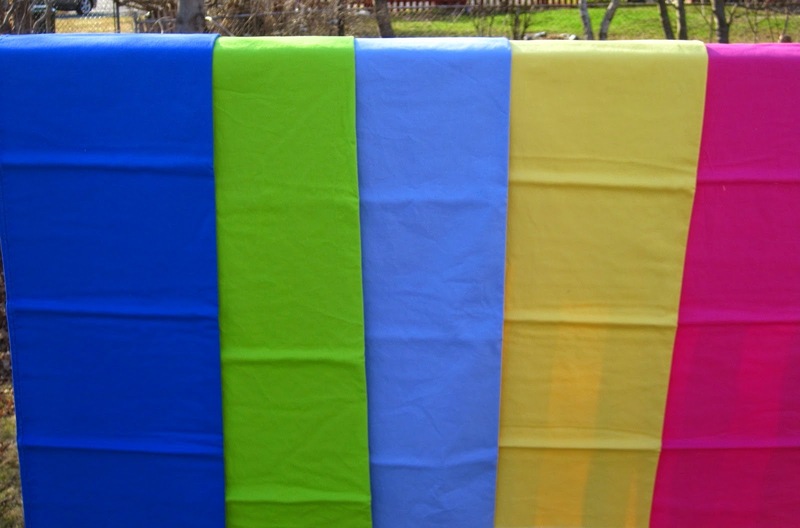 I have fabric for Night Sky, Gravity, Delight, and Glimmer. If I ever won the lottery, I'd buy a bolt of all 303 Kona colours. Here are some of my favourite past projects. 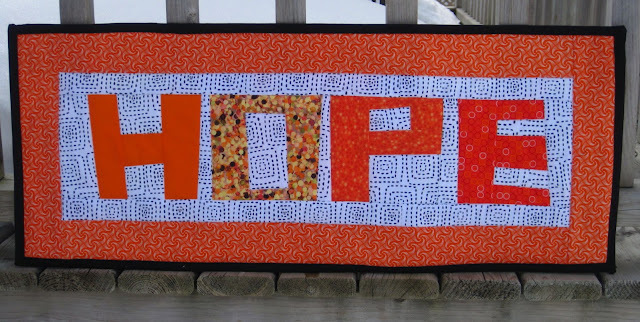 Here's the blog hop schedule. Stop by and meet some of the other MMQG members. In order to keep up with the cool kids, I have a giveaway as well. 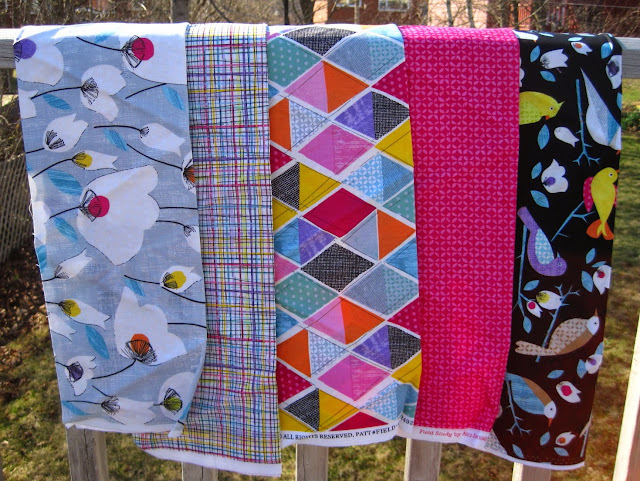 These five fat quarters are bright and cheery. It's so nice to have daylight after work and no snow in the yard!! Leave a comment on this post by midnight Wednesday, May 13, 2015. A winner will be drawn on Thursday, May 14. 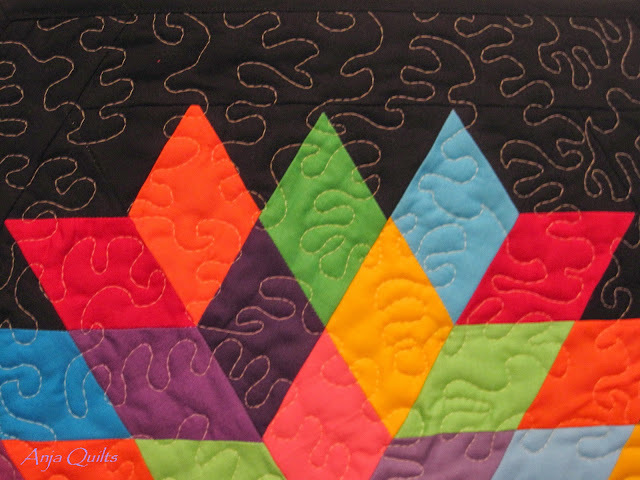 Welcome to the Maritime Modern Quilt Guild Blog Hop. This is your chance to meet some of the members and see what we are working on. Here's the blog hop schedule. 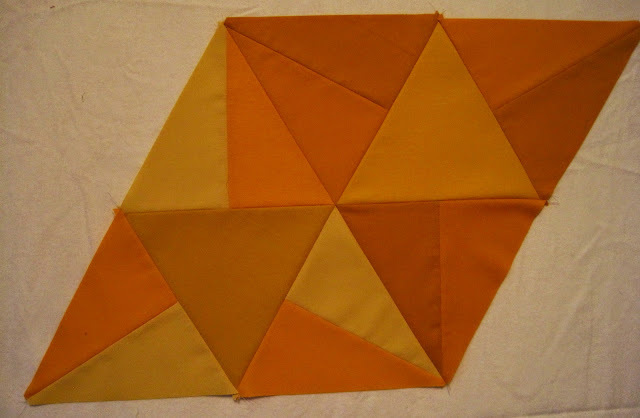 Today's blog post is brought to you by the letter K Kona. 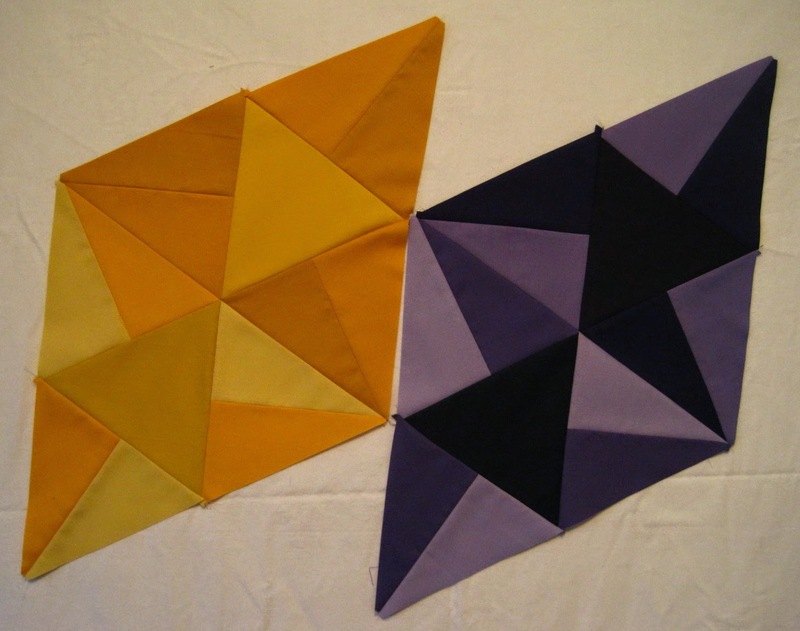 These lovely Kona's have been in my stash for some time while I debate what to do with them. If you have any pattern suggestions, they will be happily accepted. Not a lot of sewing this past weekend, as I may have (although I'm not admitting to it...) spent more than my fair share of time at our LQS. In my own defence, there was a sale. 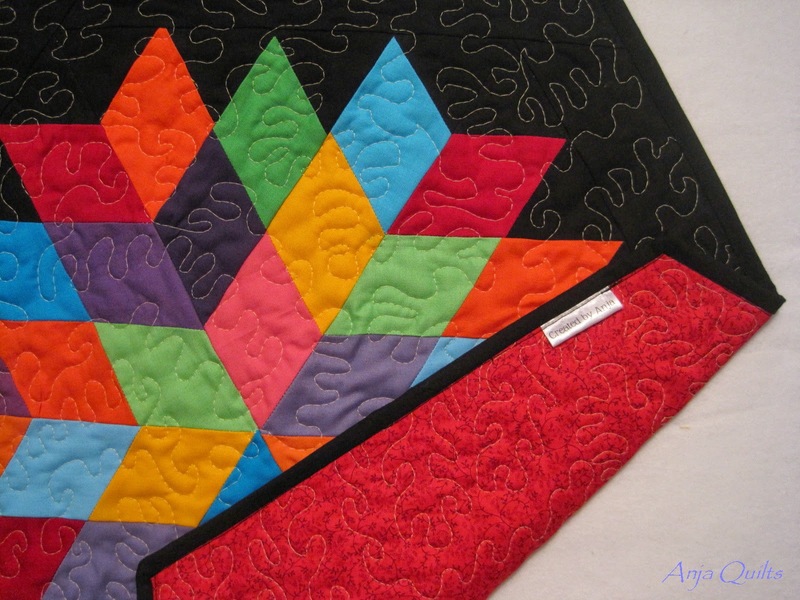 Sufficed to say, there is absolutely no need whatsoever for me to visit any quilt shop (online or physical) for many months to come. Nerd? I prefer the term "intellectual badass." 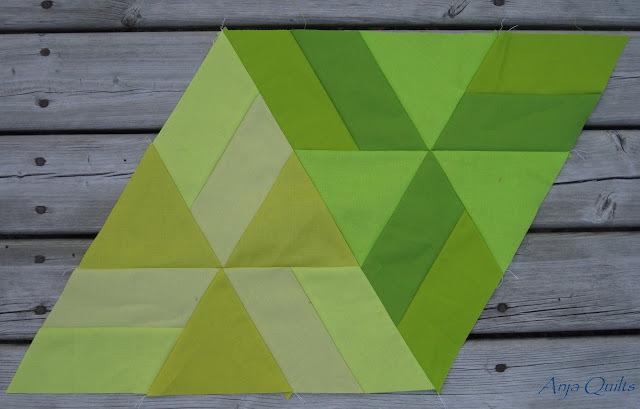 Happy blog hopping and sewing this week. 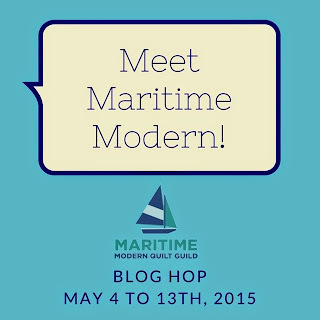 I hope you visit again on Friday when it's my turn on the Meet Maritime Modern blog hop.